Kick-start your RPG creations today! The RTP included with your copy of Ace has plenty of materials to get you started. But we're more than happy to send you extra resources for your soon-to-be awesome creations. The best part? They're free. We also have a resource store with even more to check out! Simply fill out the form below, and you'll be on your way to collecting your free bonuses! We hate spam. So we will never sell your email address to any 3rd party or send you nasty spam. We promise. 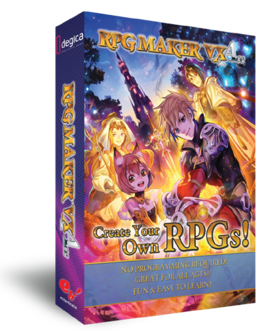 Thank you for your purchase of RPG Maker VX Ace! We would like to take the time to thank you sincerely for your purchase. That's why we're going to send you some awesome free bonuses. Have fun, and thanks again! to our Facebook page and we'll set you up with $5 of store credit for free!